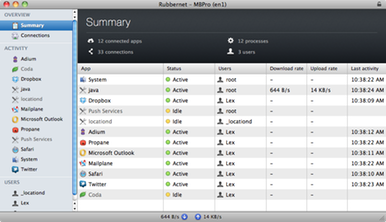 Conceited Software on Monday unveiled Rubbernet, a network traffic monitoring tool for Mac OS X. The software offers a real-time look at which software on your Mac is currently sending data up or down over your network connection, and also stores per-app bandwidth usage histories. To work its network-monitoring magic, Rubbernet requires that you install a daemon on your Mac that runs silently in the background, observing all the network activity. The software also lets you install the daemon on other networked Macs, so that you can monitor those machines’ network activity, too. All that network activity is logged both per-app and per-user. Should you decide that you no longer want to monitor a machine’s network activity, Rubbernet makes it painless to uninstall the daemon from inside the app. The data Rubbernet gathers is certainly interesting. I could watch as Twitter and Dropbox continually polled a few domains apiece to check for new updates, see every time that Gmail checked for new e-mails (within the Mailplane app), and observe my Mac’s real-time overall bandwidth usage. Conceited Software offers a free 15-day trial of Rubbernet on its Website. The app costs €30, or about $44 (or, if you prefer, 508 Mexican pesos).